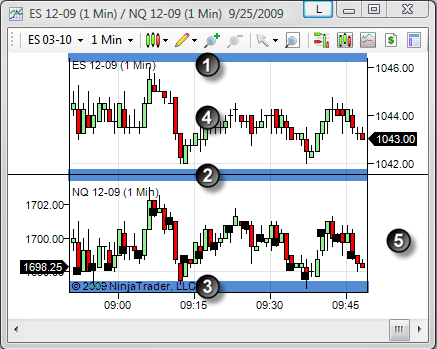 The following section covers navigation and display of NinjaTrader charts. If the horizontal axis is scrolled to the left or right from its starting location, a "return" icon will appear in the top right hand corner of the chart. Left mouse click on the icon to return the horizontal axis to its original position before scrolling occurred. 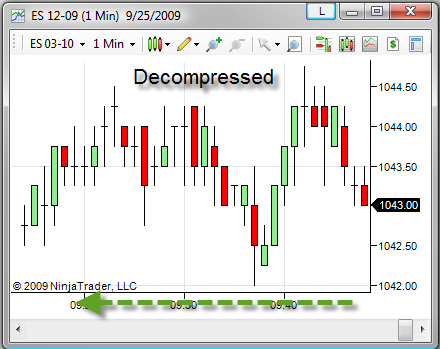 To compress or decompress the horizontal axis, left mouse click in the x- axis margin and move the mouse cursor to the left or right. Alternatively, use the Hot Keys CTRL + Up and CTRL + Down. 1. 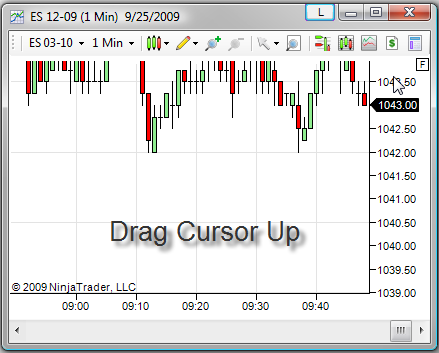 Double click in the right or left margin to open the Chart Panel Properties window, or right mouse click in the price scale and select the menu Properties... Set the Range to Fixed and enter a Maximum and Minimum for the chart scale. 2. Left mouse click and while holding down the left mouse button, draw a zoom frame region and release the button. 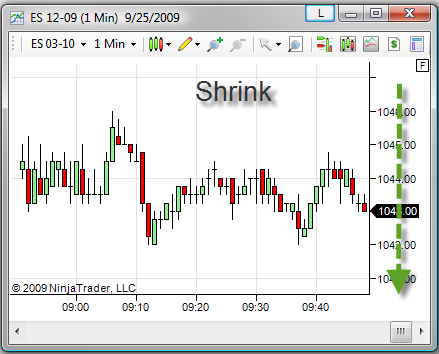 The chart display area will zoom in to the selected frame area. Each zoom in can be undone to the prior zoom level with a zoom out. To zoom out, left mouse click on the Zoom Out icon in the chart tool bar, select the Zoom Out menu item within the right mouse button click context menu, or use the zoom out Hot Key CTRL+O. Before changing bar spacing or width, you must select the Data Series you want to adjust by left mouse clicking on it. If none is selected, the primary Data Series of the chart will be adjusted. 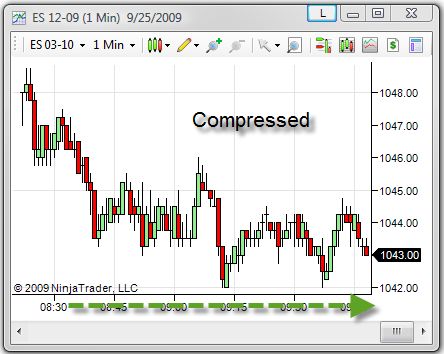 With the exception of the Overlay scale, a price scale will only be displayed in a Panel if there is one or more chart objects justified to it. 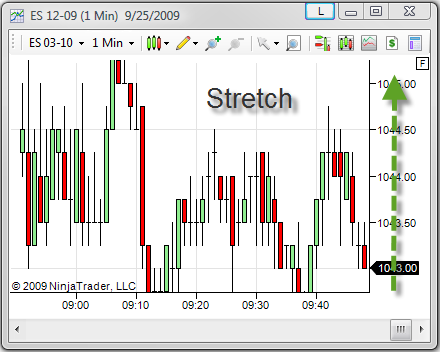 The Overlay scale does not have a visible price scale however, any chart objects justified to this scale will display their price markers first on the Right scale if one exists otherwise they are displayed on the Left scale. All scales can be shared by multiple chart objects. In addition to changing a chart objects scale justification property via the Data Series window or Indicators window, you can drag and drop a chart object onto different scales. 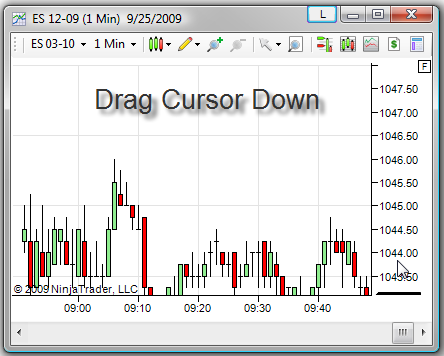 Please see the sub-section ("How to drag and drop chart objects") lower down within this topic page. 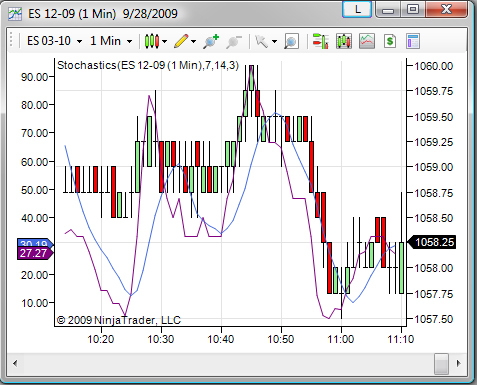 The image above depicts the ES 12-09 futures contract justified to the Right scale and a Stochastics indicator justified to the Left scale within the same Panel. The Panel Properties menu can be opened by double left mouse clicking within the price scale or selecting the Properties menu via the Panel Context menu discussed above. The Panel Properties window will list the properties below grouped by each scale that is currently active on the Panel. Sets the range to "Automatic" or "Fixed." 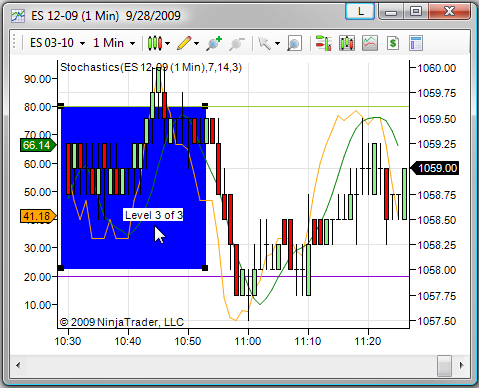 Fixed allows the manual setting of the upper and lower boundary of the chart. The range can also be manually defined via the mouse. Please see the section above "How to change the vertical scale and range of a chart". Sets a value indicating how the automatic scale range is calculated. When set to “EntireDateRangeSeriesOnly”, Data Series and Indicator values for the entire date range of the chart (draw objects are ignored) are used to calculate the vertical scale range. When set to “ScreenDateRange”, all visible objects on the screen are used. Sets the vertical interval of the horizontal axis. A value of 0 (zero) will enable the automatic generation of grid line intervals. The Right scale will always take precedence over the left scale if both are set to user defined custom grid line intervals. Sets the scaling type to "Linear" or "Logarithmic"
A Data Series or Indicator can be dragged and dropped to various areas of the chart to quickly change which panel it is displayed in. 5. Left or right area of a panel - Relocates the selected chart object to this panel (unless already in the selected panel) and changes the scale justification to the selected side of the panel. When you drag a selected object to a valid region on the chart, a blue band will appear acknowledging you that by dropping the object at this particular location, a new panel will be created. Objects within a panel can be adjusted by paint order to appear behind or in front of another chart object. You can change the z-order (paint order) of all chart objects within each individual panel. Each chart object is assigned a level value which informs you where in the paint order the particular object resides. As a rule of thumb, there are as many levels on a panel as there are chart objects on it. For example, if you had a Data Series and a simple moving average indicator on a panel, there would be two painting levels. Level 1 is the top most level which means that any chart object on Level 1 would be painted above all others. Continuing our example, if the Data Series was on Level 1 of 2 and the simple moving average was on Level 2 of 2, that would mean the Data Series would be painted on top of the Data Series. 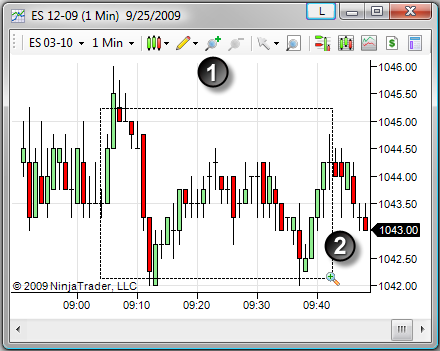 The image below depicts a "Rectangle" drawing object set at z-order Level 3 of 3, which is behind both the Stochastics indicator (Level 2 of 3) and the ES 12-09 Data Series (Level 1 of 3). 2. Hold down the "Shift" key on your keyboard and roll the mouse scroll wheel to change the z-order of the object. The current position out of the total number of levels in the z-scale will be displayed. Note: Draw objects originating from a NinjaScript indicator or strategy will all generally share the same z-order as the script. To have the objects on a separate z-order would have to be set programmatically.